The box that this stereo came in was very sleek and well designed. It looked good and could definitely be considered eye catching. 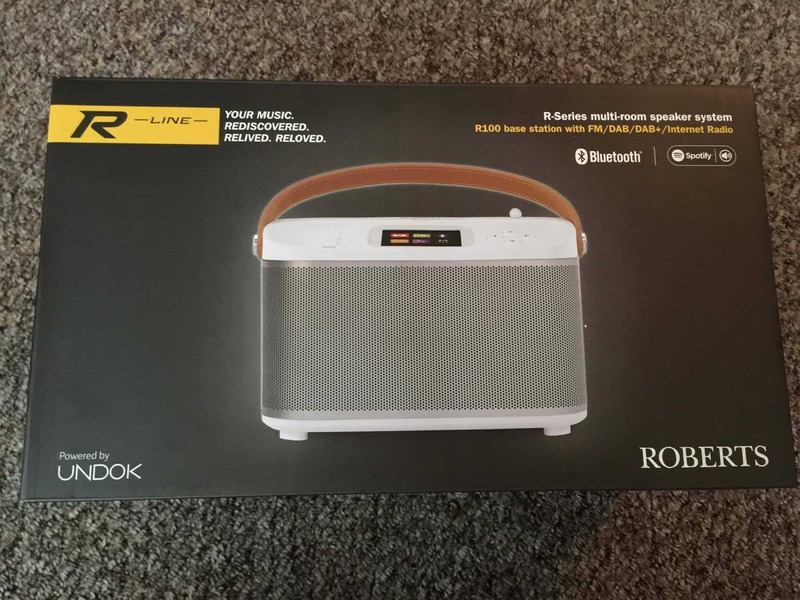 Upon opening the box, I noticed that the stereo was incredibly well packaged and secure, so there was no risk of it moving around in the box. The mains adaptor was placed neatly beside the main machine and individually wrapped. Once fully unpacked, I was able to appreciate the retro design and its overall look. It has the perfect blend of old and new, and the LCD panel at the top brings the perfect modern twist to this device. It’s small enough that it can fit comfortably on most surfaces, and the retractable antenna gives it an extra classic feel. The grey and white colouration lets it blend in nicely with your current aesthetic. 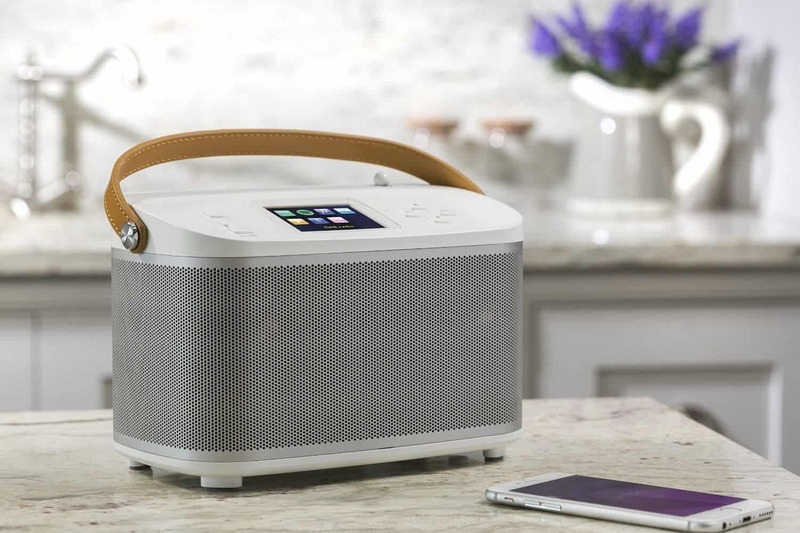 The leather strap that is attached to the stereo makes it incredibly portable, so you can take your music with you wherever you want. This is further supported by the inclusion of a rechargeable battery, so that you have the option to use it with the mains power or on the go. 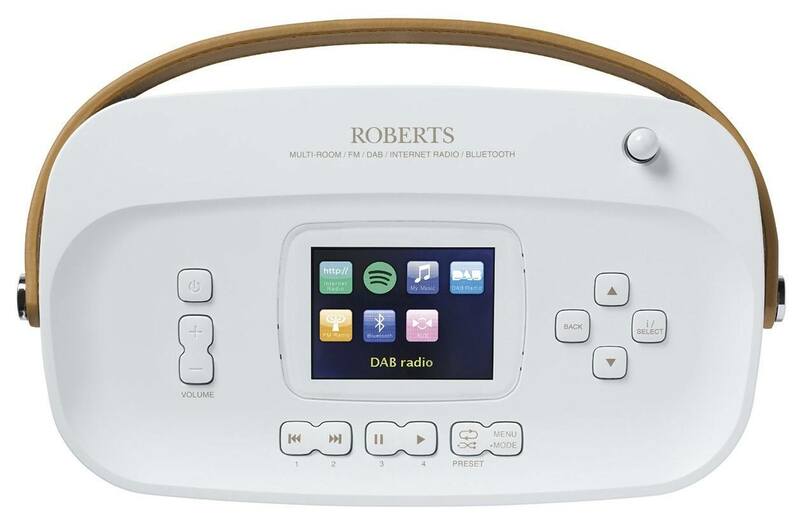 It brings a new level of versatility to this Roberts stereo. It can be controlled using your smartphone, which is great for those who like a little extra tech with their electronic products. The whole system is easy to set up, including the actual stereo. A manual is provided by it is hardly needed (if at all). The only downside is that if you do not connect it to your Wi-Fi right way, it sends constant reminders to do so. While the stereo can be used offline, the prompt does become rather irritating over time. The additional features that this stereo has are great. Streaming Spotify works very well, with no connection issues thus far. It was quick and easy to set up. 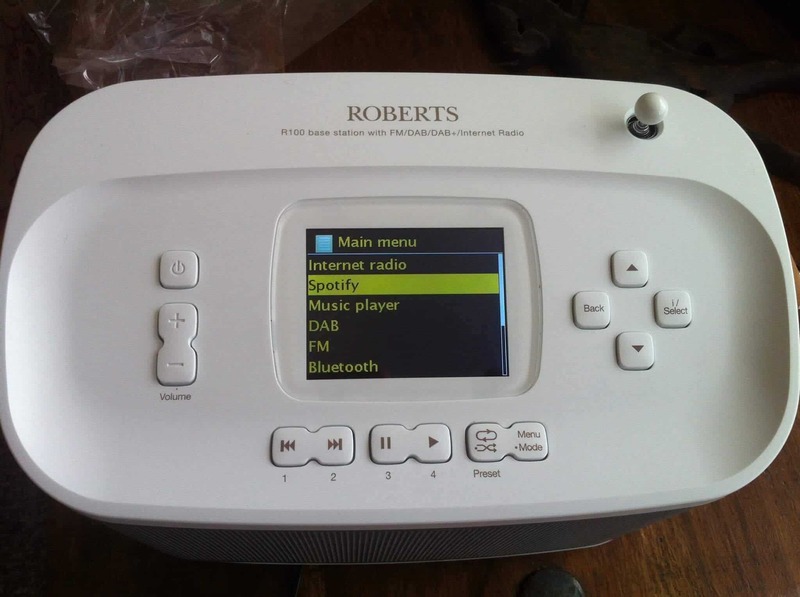 Plus, it has access to the internet radio, which is a huge plus, as well as FM, DBM, and DBM+. The Bluetooth allows it to work seamlessly with your phone or PC, and the connection has remained strong so far. In addition to streaming music from your devices, there is also a USB port so that you can play all of your favourite music directly from the drive. It’s very simple to do, just plug in the USB drive and press play. The music will start streaming and you can dance or sing along with it. When setting this up, you can choose to have the stereo set up as a left or right speaker if you want. This is because it can also be part of a multi-room sound system that uses multiple speakers to keep the music playing throughout your home. I was not able to test this and so cannot comment on its success, but the reviews say it is a superb additional feature. Plus, it’s easy to set up and speakers can be grouped and ungrouped with ease. You can even have different music in each room! The feet on the bottom of the stereo are there to keep it from toppling over, and ensure it remains secure on all surfaces. This means that it is more protected from accidentally being knocked of a surface than most other stereos. Finally, all of the controls you need are neatly placed on the top of the stereo and around the LCD screen at the top. They are white like the machine, making them hardly noticeable, but they are easy to use. Always consult the manual if you get stuck, this one is actually very helpful. The sound quality is great, especially considering the size of this machine. It is not ground breaking and unlike anything I have heard before, but it really is a good model with decent sound. The voices on the radio are quite crisp and very clear, allowing you to hear them better than of you were using a phone or much cheaper radio to listen. I would probably describe the sound as quite mellow and clear. There is something somewhat relaxing about the way this stereo sounds, and sitting back listening to it on a lazy afternoon creates the perfect setting. It certainly isn’t hi-fi or anything fancy like that, but for the money it costs it does a decent job. Despite its size, it can fill a large room with music easily, and there is a level of bass included. It is a shame you cannot set the bass and treble yourself, but the provided levels are decent enough. It would also have been nice if a remote was included for volume control for those that do not have or want to use smartphones. The streaming services have an equal good quality when It comes to sound. Going into the other room with my phone while it was streaking to this stereo did not have any negative effects on the quality of the sound, showing that it is able to work just fine with a wall between it and the source of the music. I hooked my PC up to the stereo while I was watching a film to take a look at the sound quality it provided. I was pleased to find that it was equally good, with no vibrations or crackling coming from the film. It showed me that the good sound quality is a definite all-rounder when it comes to this machine. For a small radio it certainly packs a lot of punch in terms of overall sound quality. This particular stereo shows that you don’t have to have outstanding and near revolutionary sound to be able to enjoy listening to something. This product does still have exquisite sound, and it is a definite must for any household that is looking for something small and diverse. Q: Can the R100 link to non-roberts speakers through Bluetooth? The answer is probably. This little radio is perfect for a winter day in the living room by the fire. It is also ideal for sitting on the kitchen counter while you cook or do the dishes. On top of this, it is perfect for long summer days in the garden, relaxing in the sun. It can even accompany you to visit friends and family, or even on a day trip with a picnic. You can take your music everywhere you go with this device, and not many stereos openly offer such diversity. It is perfect both for the home and outdoor adventurer. 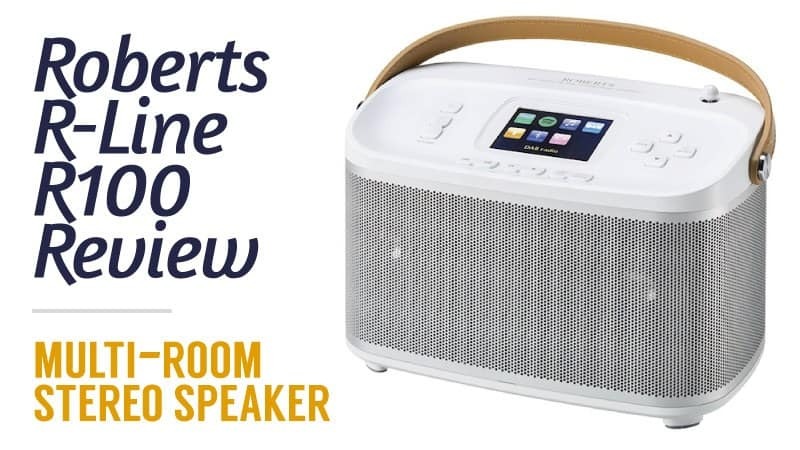 If you are looking for something with excellent sound quality, portability, as well as a range of streaming and tech additional features, then this one is well worth you spending the extra money. After all, all of your music can be kept in one easy to access place (including your USB music) so that you don’t need to skip between devices. If you don’t have a Spotify account before purchasing this then it is definitely worth getting one, nearly every song ever made is in one easy to stream library that is always at your fingertips. A definite must buy for the music lovers. I’ll admit I wasn’t sure what to expect at first, and I knew there weren’t going to be any revolutionary sounds coming from this device. However, I was wonderfully surprised at the quality of sound that this stereo is able to provide, and as a result it has made the perfect household companion for me both during my work and cleaning. 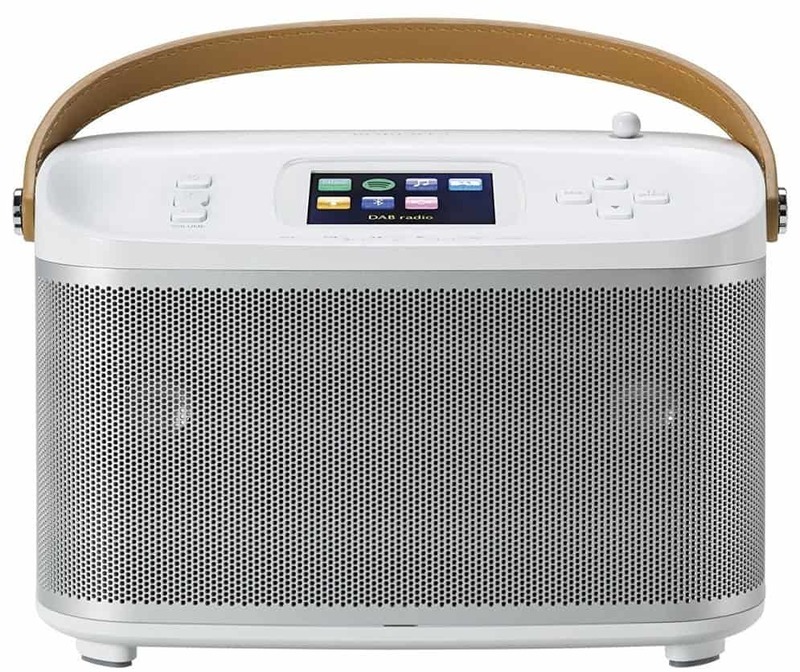 I can bring it with me anywhere I want, letting friends and family experience great music and radio shows with me. With 2000 to choose from on the internet radio (including podcasts), there is something there to entertain everyone. The portability is such an important aspect of this model, and everyone is surprised as I am by the sound quality it provides for such a little machine. It was certainly made to impress in terms of looks as well as quality. As a result, this is not an item I regret choosing. It’s a great find, and while the price tag my seem a little high, you only have to listen to know that this retro yet modern stereo was well worth it.